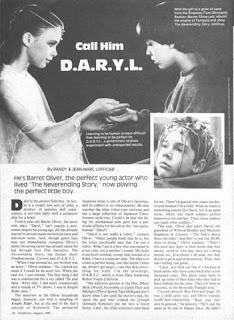 He's Barret Oliver, the perfect young actor who lived "The Neverending Story," now playing the perfect little boy. Daryl is the perfect little boy. In fact he is a totally new sort of child, a product of genetics and super-science, a test-tube baby with a computer chip fro a brain. Twelve-year-old Barret Oliver, the actor who plays "Daryl" isn't exactly a newcomer despite his young age. He has already starred in several major motion pictures and television series. And, though genre fans may not immediately recognize Oliver's name, his acting career has already taken the lad through four film fantasies: The Neverending Story, the Disney short, Frankenweenie, Cocoon and D.A.R.Y.L..
"When I was around six, my brother was an actor," Oliver explains, "So I asked my mom if I could be an actor too. When she said yes, I just started. The first thing I did was a commercial for a toy called ['Sit and Spies?.'] After that I did more commercials and a couple TV shows. I was in Knight Rider once." The interview with the Oliver household began, however, not with a sampling of Knight Rider, but at the end of the day's episode of [Roboteck?]. The animated Japanese series is one of Oliver's favorites, and he collects it on videocassette. He also watches the other robot-type cartoons and has a large collection of Japanese Transformers-style toys. Could it be that this liking for mechanical men gave him a particular affinity for his role as the "not-quite human" Daryl? "Daryl is not really a robot," comments Oliver, "Many people think that he is, but the script particularly says that I'm not a robot. What I am is a boy who was raised in a test-tube, not a mother's womb. My body is perfectly normal, except that instead of a brain, I have a computer chip. The idea is to create a perfect being, one that doesn't mess up, doesn't get angry--one that does everything for itself. I'm the prototype, D.A.R.Y.L., which is from Data Analyzing Robot Youth Lifeform." "My adoptive parents in the film [Mary Beth (World According to [George?]) Hurt and Micheal (This Is Spinal Tap) McKean] don't know what I am until the movie's end, because the guy who created me (Joeseph Sommer) put me into a foster home. Later, the other scientists come back for me. There's a general who wants me destroyed because I'm a child. What he wants is something essentially like Daryl, but in an adult form, which can teach soldiers perfect measures for warfare. Then, those soldiers teach other soldiers." This year, Oliver plays David, the grandson of Wilford Brimley and Maureen Stapleton in Cocoon. "The film's about these old folks--and they're real old, 80, 90, close to dying," Oliver explains. "There's this pool next door to their home that they always swim in. One day, they see it being rented out. Everybody's all [? ], but they decide to go in and swim anyway. Then, they start feeling real good....."
"Later, you find out that it's because of these aliens who have come back after a few thousand years. The aliens came back to pick up some of their kind who they had to leave behind the last time. They left them in cocoons, in the Bermuda Triangle area." 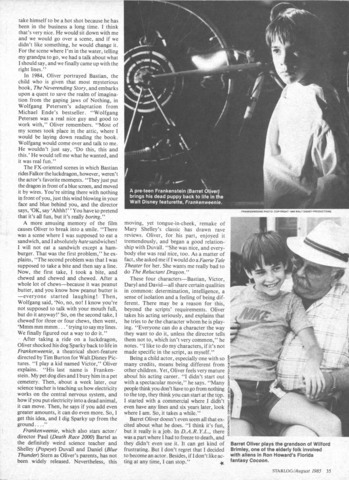 Cocoon director Ron Howard (page 15) was a child actor too, and Oliver warmly recalls their relationship. "Ron was very nice in general," he answers. "He's just the same as he was in Happy Days. He didn't take himself to be a hot shot because he has been in the business a long time. I think that's very nice. He would sit down with me and we would go over a scene, and if we didn't like something, he would change it. For the scene where I' in the water, telling my grampa to go, we had a talk about what I would say, and we finally came up with the right lines." In 1984, Oliver portrayed Bastian, the child who is given the most mysterious book, The Neverending Story, and embarks upon a quest to save the realm of imagination from the gaping jaws of Nothing, in Wolfgang Peterson's adaptation from Michael Ende's bestseller. "Wolfgang Peterson was a real nice guy and good to work with," Oliver remembers, "Most of my scenes took place in the attic, where I would be laying down reading the book. Wolfgang would come over and talk to me. He wouldn't just say, 'Do this, this and this.' He would tell me what he wanted, and it was real fun." The FX-oriented scenes in which Bastian rides Falcor the luckdragon, however, weren't the actor's favorite memories. "They just put the dragon in front of a blue screen, and moved it by wires. You're sitting there wit nothing in front of you, just this wind blowing in your face and blue behind you, and the director says, 'OK, say 'Ahhh!' You have to pretend that it's all fun, but it's really boring." A more amusing memory of the film causes Oliver to break into a smile. "There was a scene where I was supposed to eat a sandwich, and I absolutely hate sandwiches! I will not eat a sandwich except a hamburger. That was the first problem," he explains, "The second problem was that I was supposed to take a bite and then say a line. Now, the first take, I took a bite, and chewed and chewed and chewed. After a whole lot of chews--because it was peanut butter, and you know how peanut butter is--everyone started laughing! Then, Wolfgang said, 'No, no, no! I know you're not supposed to talk with your mouth full, but do it anyway!" So, on the second take, I chewed for three or four chews, then went, "Mmm mm mmm..." trying to say my lines. We finally figured out a way to do it." After taking a ride on a luckdragon, Oliver shocked his dog Sparky to life in Frankenweenie, a theatrical short-feature directed by Tim Burton for Walt Disney Pictures. "I play a kid named Victor," Oliver explains, "His last name is Frankenstein. My pet dog dies and I bury him in a pet cemetery. Then, about a week later, our science teacher is teaching us how electricity works on the central nervous system, and how if you put electricity into a dead animal, it can move. Then, he says if you add even greater amounts, it can do even more. So, I get this idea, and I dig Sparky up from the ground...."
Frankenweenie, which also stars actor/ directed Paul (Death Race 2000) Bartel as the definitely weird science teacher and Shelley (Popeye) Duvall and Daniel (War Thunder) Storm as Oliver's parents, has not been widely released. Nonetheless, this moving, yet tongue-in-cheek, remake of Mary Shelley's classic has drawn rave reviews. Oliver, for his part, enjoyed it tremendously, and began a good relationship with Duvall. "She was nice, and everybody said she was was real nice, too. As a matter of fact, she asked me if I would do a Faery Tale Theatre for her. She wants me really bad to do The Reluctant Dragon." These four characters--Bastian, Victor, Daryl and David, all share certain qualities in common: determination, intelligence, a sense of isolation and a feeling of being different. here may be a reason for this, beyond the scripts' requirements. Oliver takes his acting seriously, and explains that he tries to be the character when he is playing. "Everyone can do a character the way they want to do it, unless the director tells them not to, which isn't very common," he notes. "I like to do my characters, if it's not made specific in the script, as myself." Being a child actor, especially one with so many credits, mean being different from other children. Yet, Oliver feels very mature about his acting career. "I didn't start out with a spectacular movie," he says, "Many people think you don't have to go from nothing to the top, they think you can start at the top. I started with a commercial where I didn't even have any lines and six years later, look where I am. So, it takes a while." Barret Oliver doesn't even seem all that excited about what he does. "I think it's fun, but it really is a job. In D.A.R.Y.L., there was a part where I had to [?] to death, and they didn't even use it. It can get kind of frustrating. But I don't regret that I decided to become an actor. Besides, if I don't like acting at any time, I can stop." I've seen the movie, he is so talented, I will support all his films, and wish him the life ever, I appreciate him as a fine actor, the real thing.